PAMELA JENNINGS: I have found that there is very little talk about artists' work using advanced technologies other than interfacing with the Internet, computer bulletin board services or hypertext. TONI DOVE: Yes, there seems to be the Internet and the whole explosion in multimedia and CD ROM, which is probably a preparation for the interactive television arena, which will probably eventually collapse the Internet, television and computers together. It's an interesting territory right now because it's not standardized yet, and so it offers a window of opportunity for artists to perhaps have some small impact on the developing vocabulary. The danger is it becoming standardized, since much of the impetus behind it is direct delivery of advertising. People tend to move towards the paths of least resistance. This can shut down other more eclectic paths through technology, because of a difficulty at securing funding and support. PJ: The learning curve is so steep for anyone, independent or corporate, wishing to create an interactive project. It takes much patience and determination to see a project completed. TD: Yes, it's really new and people are just beginning to experiment with it. And the whole notion of interactivity and its potentials is very complex. Yet currently, it's being produced as a very simple concept where you navigate through a book. Some of the major CD ROMs have quite simple interactivity at this point. The whole notion of navigation and non linearity is a problem in terms of programming, in terms of authoring tools and in terms of creative people's access to developing tools. It's an interesting problem and it's in a state of evolution. As an artist, you're sort of involved in a territory where you're building a piano in order to compose the sonata. I often find myself in this situation. PJ: That's a great analogy. It's trailblazing. TD: Yes, you have to build the instrument in order to make the piece. Although I'm interested in the new technologies, I'm not a programmer. I'm a techie to some degree, but I'm not somebody who can sit down and play with chips and rewire circuits and stuff. Although I am learning, I don't want to be exclusively involved with the programming end of things. I've found that what happens is that all your energy and focus goes into the technology. Then the work becomes about the technology and not the content. One of the ways that I've discovered to deal with that is to work with a programmer. It's been both very interesting and frustrating. Sometimes it can be like eating with a fourteen foot fork because you want to do things and you have to do it through this conduit in order to make the behaviors happen. It's a collaboration with another person's ideas and with a whole set of possibilities inherent in a programming language. I'm interested in developing some kind of an authoring system for interactivity that can be a base that I then can work from. If I find that it's an interesting place to work from then I'll be able to build on it over a period of time, so that I don't end up with each project starting almost completely from scratch, which happens to a certain degree anyway. PJ: So you're developing specialized software that you can always use as a foundation? TD: Yes, I'm using some existing systems and then I'm developing some new links between systems that work for what I want to do. And I try to keep it simple. But it never is. I found when I was working on the Virtual Reality Project at Banff, Archeology of a Mother Tongue, that I had been used to working with technology that I had never worked with before, but was not used to working with technology that nobody had ever used before. So we were kind of making up the vocabulary as we went along. It was quite fascinating, but in that particular case we were working with very high end equipment. It's problematic to some degree because you have a piece that becomes vaporware because nobody has the equipment to run it on, nobody has access to the equipment. It's fascinating and I would be interested in doing it again, but it's not something I would want to make the base of my practice because I want my work to be more accessible. PJ: The Banff Centre for the Arts Virtual Reality project, Archeology of a Mother Tongue, has basically been presented through video tape. TD: Right, it's been shown a few times as a Virtual Reality installation, and it will probably be shown again. As the equipment becomes more accessible it will become an historic artifact. That's not uninteresting to me, but it's not exactly the territory that I want to exist in. TD: It's definitely a real issue because this is a very technologized society. The whole culture is very focused on new technology. But access is very selective. I think there's a trickle down factor with obsolete equipment that has tremendous acceleration because technological developments are moving so fast. That sense of access is constantly increasing, for example, DJ's doing hip hop scratching with LPs. That's a really interesting manipulation and reuse of information and data that's based on essentially an obsolete technology. I think that's always been an extremely interesting territory for artists. The artist's book movement escalated with lithography displacing letterpress and letterpress becoming a cheap and accessible technology. As artists we are also interested in getting our hands on the best and newest stuff, to see what it can produce. PJ: So then we try to get to Banff. TD: Yes, you go and work in these places. But it's not necessarily always the most interesting place to work from. I've used a lot of slide technology in Mesmer-Secrets of the Human Frame and The Blessed Abyss  A Tale of Unmanageable Ecstasies. I'm using less of that right now because I'm getting involved in desktop video, but I've always been interested in mixing high tech and low tech and being able to create some kind of collage where you can develop an aesthetic out of a bunch of technologies. Most of these are developed for corporate use in some way and have imbedded in them an aesthetic and a way of working. I think that this is true across the board with technology. There are never, obviously, neutral tools. Uses of color and concepts of resolution start to become built in as part of an aesthetic that isn't necessarily the best or most interesting way to use equipment. Maybe the sharpest clearest image, or the most colors may in fact make your work look more like a Mitsubishi ad than what you were interested in. I think it's really interesting for artists to work with a variety of tools and to keep questioning commercial aesthetic standards. PJ: There doesn't seem to be a concern or desire to bring independents into or creating a space for independent's work within the proposed five hundred channels and interactive television. TD: No, I don't think they're even slightly interested. I don't think that that's planned ever. I don't think there was a plan to encourage independent production in film. But I think what they discovered was that they could make money from independent film projects, that there were smaller audiences perhaps, but also smaller budgets for films that could actually make money. That's the bottom line. If that works, then those things survive. TD: Yes, it's a cuckoo passion. And that's another reason why I want to start to be able to standardize what I'm doing to some degree. So that every time I do a project, I don't need a whole knew set of equipment. Also as you're working closer to the bleeding edge, the access to the equipment becomes trickier because some of it isn't rentable, some of it's very expensive and there are less people who know how to use it and work with it. It also brings with it a certain kind of attention which I think is interesting and alarming at the same time. I found for instance, when I did the VR piece, that I got more press and more publicity around that piece even though fewer people saw it and fewer people knew the content of it. There would be a still image here or there. Or a tape that would float around. And yet that piece got tremendous publicity. That's very seductive. This happens if you're working in an area of technology where there's a lot of publicity and interest. I kind of tripped into it by accident. I wasn't particularly interested in virtual reality or interactivity. As a result of working on that project, I got fascinated with a couple of aspects of interactivity that I didn't get a chance to work through in the context of that project, which I'm working through now. One of them had to do with the idea of immersion in a narrative space. The sensation of walking around in a movie, of actually being inside of a narrative space. And the other aspect, was a certain kind of virtual illusion that results when a physical action produces a response in video and audio. And that can be a powerful and actually sensual experience. That interested me because it seemed to subvert or undercut some of the rhetoric of dis-incarnation that surrounds a lot of new technology. So those were a couple of things I wanted to explore a little bit more. PJ: Can you further explain what you mean by dis-incarnation? TD: Well I think that people tend to think of the relationship to technology as being dis-embodied and non-physical, virtual. There's an anxiety that surrounds that. People not being able to touch their work, of it being immaterial in some way, and excluding the body. I think in some ways that the explosion of interest around issues of the body is related to that anxiety about the disappearance of the body within the technical sphere, for instance, the Internet. There's all sorts of discussion about developing communities and gender confusions and realignments, and all kinds of things that can happen in a virtual community because of their non physical nature. I think that is part of what's made the whole contemporary theoretical examination of the body an interesting frontier of discussion. PJ: What do you think about the concept that there are opposing philosophical camps happening in the discourse on new technology? One in which the physical body is no longer deemed as having importance in terms of communication and identification. Rather it is symbolized by abstractions. And another discourse where technology is viewed as a bridge to unite bodies and minds across gaps where the physicality of individuals may prove to be a hinderance toward communication. TD: I don't think that I would set it up as a polarity. I think that it's more complex and fluid than that. The technologies themselves are changing so rapidly, they're so new, our access to them is changing so rapidly. You know, who has access, who doesn't have access. And our familiarity with whole territories of technology is shifting constantly. For instance, in the process of designing an interactive piece or designing a CD ROM, you're dealing with a situation where the recipes for production and reception are not yet standardized. So there isn't anything given in terms of your user and their familiarity with the system. There are certain kinds of things you have to be self-conscious about, in that context, because you know you have somebody coming in who won't know how to use it. There won't be things that are familiar that will funnel them into some way of doing things, so you really start from ground zero. You have to think in terms of people's sense of agency. I think it's a very interesting thing because it can cause you to think in critical terms, in terms of the social ramifications, the behavioral ramifications, the political ramifications, the economical ramifications, all the ramifications of each move that you make in developing some kind of syntax for use. The piece that you design now five years from now, when there's a different level of familiarity with use, will be used differently and seen differently. That's a very odd and interesting situation to be in, to have that sense of instability and transience in relationship to the work. It's so new. It's developing so quickly that ideas around it, for instance, the idea of relationships to technology that are technophilic, technophobic, that have to do with dis incarnation, incarnation, all these kind of things are complicated and integrated into this whole very rapidly evolving set of issues which at this point is kind of primitive. So I don't think you can codify it in a way where you'd say there's an approach that would look at it one way or the other. I think that they're all folding into each other and breaking up and reforming. It's very quick right now. With my own ideas, I'll work with something for a while and I'll start to have a critical take on it and that will collapse and shift. PJ: Creating new foundations for navigation through what can be called interactive work is really pretty broad. TD: Yes, it is pretty broad. Even the word interactive I think is kind of weird and problematic, because I think in some ways it's a false icon. It's produced by notions of advertising that deliver a fraudulent sense of empowerment and agency. In other words, you replace intellectual challenge with multiple choice. You give people a sense of activity and empowerment that implies choices that aren't really there. It's interesting the way a rhetoric develops around things. If you look at the telephone, which is one of the first interactive technologies, and the kind of rhetoric that has developed around "being there." You know, "Reach out and touch someone." And that's similar to a language that's developing around virtual reality. This whole notion of being there, touching someone, of being connected as some kind of community. That is, in fact, the opposite of what's happening. You're not there at all. But then there's a whole new technological sphere in which communications are made and increased, so a completely different kind of community is evolving. And it does exist as community. I don't know, it's interesting. PJ: I think that doing work that's "interactive" is more manipulative. Even though there's the rhetoric of choice, the choice is what the maker or artists decides to give the user. In a way you're leading a person down a pathway that says, "You , the user, can think you're deciding the way you're going. But I, the maker, have already decided your fate." TD: Also, as an artist I have to say that I'm not particularly interested in creating tools for other people to be creative with. I'm not interested in something that has a tool base, or something that is a place for other people to make things. Because I have a vision or a concept of something or an experience of something that I want to deliver. And in some sense I guess you can say that that's always been manipulative. I'm more interested in responsive environments. In creating an environment that has a personality that reacts to a user. I'd like to explore the cinematic environment into something more immersing. It's interesting to me because it suits certain concepts of narrative that I have. 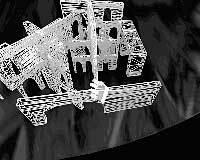 I think of narrative as a wandering accretion in a three dimensional cube. And I've never been involved in story or plot in a traditional sense. I tend to work with narrative as an accretion and look for different kinds of engines that move it through time. I think it's tricky. The problematic side is that if you don't have a traditional engine, you have to be careful that you do have some kind of engine or you end up with cinematic wall paper, or a trance state that doesn't produce a trance. Already within the interactive realm there's a number of cliches developing to replace some of the traditional vocabulary of plot, like suspense that is built up based on conflict. This has been replaced in the game arena by dropping somebody in a pit and giving them 30 seconds to get out. I think that there are more complex possibilities for creating a dimensional narrative, and it may not be something that is completely non-linear. It may not be non-linear in a looping random access logic tree structure. It may be something that you move through in some linear fashion but has a different sense of dimension. PJ: Like depth, on the z plane. TD: Or parallel realities, or just a more complex three dimensional time space. It's like asking a set of questions, or opening up a potential set of streams of thought, or giving people a place to explore an idea, or setting up something that gives a person a place to think from. PJ: I find sometimes that I have a tug a war between my desire to make a set of images designed for the user to sit back and watch, and trying to figure out when and where to put some form of interactivity or "choice." TD: I think that we're so imbedded in the notion of linearity, that when you first start thinking in terms of non-linear structure it's a very self conscious procedure. I can plot out a video that's linear or an installation. It may not be a traditional plot, but it has a time base  a beginning, middle and end. I can plot that. But at this particular point for me to plot something that's interactive is much more difficult to preconceive. I can preconceive chunks of it and then I have to set it up and get in it and see how it works and then do that again. Perhaps others, especially music people who have been working with interactivity for longer and have a more complex and deep concept of the possibilities of interactivity, can think about that space in a very different way than I can at this point. So I understand what you're saying. I find that as the length of the projects I work on expands, because I'm interested in work that I can develop in a more complex way, I'm getting more involved in the notion of story. Not necessarily in a traditional way. I have to figure out how to design that story so that something happens, so it isn't like wallpaper, and I've been thinking a lot about what kinds of narrative engines I use. I think that there are two things that I tend to work with: one is a kind of escalation of emotional environment that often happens through the use of sound, and the other one is the developing of a philosophical concept that is subliminal to the text. So that the text is being produced as a fictional space or as a poetic space, but there's an idea driving it underneath that has to do with the thing that you're trying to say. That becomes a kind of hidden engine for how you go somewhere. But then figuring out how to design that interactively so that there is satisfaction that you get from things happening  does it need chronology or not? What moves people through a space so that it doesn't feel like being caught in a revolving door? There's a method used often now that involves a logic tree where people are making these incredibly complex pieces that have very detailed programming and branching. And it's like, I don't know, it's like serving peeled, stuffed grapes to 40,000 or something or washing your kitchen floor with a Q-Tip. There's a labor intensiveness to it that I find extremely unappealing as a creative process. It has a level of tedium. I think it's also a process that will be replaced as authoring tools become more sophisticated. That's another aspect, how these tools are going to develop. And how creative artists are going to have access to these tools. And how the tools will be less about high level programming languages and more about intuitive graphic interfaces. PJ: It seems like that would be crucial in order to bring more artists and independent producers into this field? TD: Now it's very complicated and not standardized. Right now, every CD ROM company is either licensing an authoring system or developing their own authoring system that they can then expand and work on. It's very complicated, it's very labor intensive, it's very time consuming. And it's a kind of nightmare. Most of the multimedia places that I've worked at are chaotic and crazy. There are endless amounts of files in different places and people keep re-naming them and they end up someplace else. PJ: Well that's exciting. But it's also a bit harrying at times. TD: It's a pain in the neck sometimes. I find that there are limits to how much I want to be invested in dealing with that level of technology in the pieces. Because there's a point where I'm spending so much time doing that and writing grants, that I don't get any time to work. So, I find that I'm starting to focus in on learning certain sets of tools that I can work with directly. And then I can hire out certain kinds of other things to people who have certain kinds of expertise in certain other kinds of tools. For instance, I'm working with MAX, an interactive programming language. I have to know more about MAX than I know right now in order to be able to understand the potential of the language, and to understand how to think in that language, even if I'm not going to be able to do very sophisticated things with it myself. If I don't understand how it works, what's easy, what's difficult, what it does most effectively, then I'm working in a dark room with the lights off. It can be very difficult to do what you want to do. Because I would be making choices that are not in step with the flow of possibilities in the technology. PJ: MAX is actually on my reading list this summer. I have about a ten inch pile of manuals that I hope to peruse. TD: MAX is like the Manhattan telephone book. It's very daunting. Especially I think if you're a non-musician. PJ: It almost seems logical that music would be the perfect transitional art form between spectator forms of art and interactive forms of art. Music has always been poly-modal in the realm of composition, counterpoint, harmony and dissonance, and a collaborative process in terms of communication between the makers, performers and audience. TD: There's an abstract quality to music. And a way in which music is not text based that allows for certain kinds of non-linear development that also makes it interesting as an interactive language. Also because the technology for interactivity and the digital production for sound has been in place a lot longer than it has for images. There are a lot of people who have been working with that for a while, and some of the interactive strategies that people have developed are more sophisticated because they are often producing interactive situations in which a performer is working with something that is more like an instrument. Instead of being aimed at a "dumb" user or someone you assume has no experience with a situation, they're often designing something for someone to learn as if it were an instrument. There is a level of craftsmanship and technical acuity and sophistication in the kinds of interactivity that happens because it's performance based. I think I've learned the most about interactivity from music people. George Lewis, who I met up at Banff, is one of the people who first began to make me think in different terms about some of the possibilities. He said that instead of setting up this predictable tree of already mapped out solutions, what you do is build a kind of machine. And then you would enter that machine and see how it behaves. If it does things that you don't like you might be able to trace that back into the program and change it, or you might not. So that you're basically developing these interconnecting sets of responsive machines. That was the beginning of an interesting way for me to think about it. I found that when I was working with sound, I was used to being able to work in a linear way where I usually develop a performed text that has a sound environment of some kind or another. I'd get sound sources, I'd create sound sources, I sampled and processed things. I work with sound very similarly to the way I work with images  a processed collage aesthetic. I had a lot of control over nuance and layers and connections and all different kinds of things that I used to make these musical spaces. And when I started working on the Virtual Reality project, everything had to be programmed. And it had to be programmed in a way where someone walking through the space would find that if they stopped and just started looking around for five minutes the sound environment would continue to be present, and it wouldn't sound like a needle stuck in a grove. So we started making these drone machines that took several samples and then re-sampled pieces of those samples and created different kinds of processing and different sets of repeating random parameters so that there was a sound atmosphere that had a continuing evolving changing shape with enough different parameters so that it didn't sound like it was repeating itself. Then within that you could bring in local sounds and sound events that were more linear. At first that seemed clumsy and difficult and problematic to me in comparison to what I had been working with, because I didn't feel as though I had as much control. And I didn't feel that I could get the kind of nuance and delicacy that I could get with the other system. But I also found that I had to just drop that way of thinking, and get involved in these rooms, these little machines. I had to let go of a whole way of thinking before I could begin to discover what the potential nuances were of this other way of working. Because I hadn't experienced it. And that to me was a breakthrough in terms in being able to think about the possibilities of how to structure concepts of interactivity. PJ: There is a strong psychological undercurrent to your work. TD: I'm interested in models of subjectivity. And creating characters that are personal representatives of social constellations and issues. And psychoanalysis has provided us with one of the few extant models of subjectivity. It's often problematic, fluid, shifting, changing and never ultimately satisfying or complete. But I've found that it's been a very useful source of information for developing characters. I do a lot of reading before I do a piece. I do a lot of theoretical reading and it helps me create social and psychological and economic armatures that I can use to build characters. PJ: When you're initiating a new project, does the concept for the work come first or the desire to work with a certain technology? Or does this happen simultaneously? TD: It's usually simultaneous. As a result of whatever previous project I was working on, there's usually some sort of spill-over of something that interested me that I didn't get a chance to follow through. Or some new technology that I've come in contact with that has certain things embedded in it which interests me  certain special effects, behaviors or possibilities. So I'll start with those and at the same time I'm thinking about other kinds of metaphors. So the two things develop simultaneously. So it's sort of a combination of concepts and special effects. And, of course, I've always been fond of magic. And technology produces certain kinds of special effects, and certain kinds of things that can be extremely powerful. I'm usually drawn to some aspect of technology that has a certain magical component for me and that will give me ideas that will generate other kinds of things. I usually work that way  special effects based. I get ideas from Hollywood movies. I don't watch television that much, because I've become such a movie freak. But I have been taking a look lately at advertising. And a lot of the computer technology is starting to surface in advertising. It's interesting, because a lot of that, if you have time, you can reproduce that "relatively" inexpensively on the desktop. And that's very interesting to me, that I have tools to make images plastic. The whole notion of photography and film as a documentary medium is toast, it's finished. It's become a completely plastic and manipulatable arena. Which is what I always wanted to do with it anyway. So it suits me quite nicely. This last piece I did on 42nd street, Casual Workers, Hallucinations and Appropriate Ghosts, is a seven minute video that loops. And most of it was done on the computer, about three minutes of it was done entirely on the computer and the rest was done as a rough cut on the computer. It was really exciting to me as a way of working. I'm interested in being able to do more work like this. I'm gradually learning a certain set of tools and ways of working that I find really interesting. It's definitely taking up my attention.